Punjab Government, the Finance department has issued a notification on 01-10-2018 about up-gradation of the posts of teachers of the education department and sent to the Accountant General, Punjab. Subject - UP-GRADATION OF THE POSTS OF TEACHERS OF EDUCATION DEPARTMENT. I am directed to refer to your letter No TM-In-IAJ2017-18. 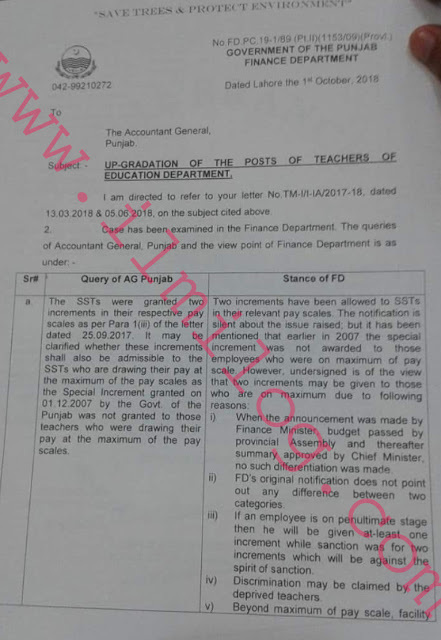 Dated 13 03 2018 & 05 06 2018 on the subject cited above Up gradation School Teachers In Punjab Finance Department Pakistan. a. The SSTs were granted two increments in their respective pay scales as per Para 1(iii) of the letter dated 25.09.2017 It may be clarified whether these increments shall also be admissible to the SSTs who are drawing their pay at the maximum of the pay scales as I the Special Increment granted on 01 12 2007 by the Govt. of Punjab was not granted to those teachers who were drawing their pay at the maximum of the pay scales. b. 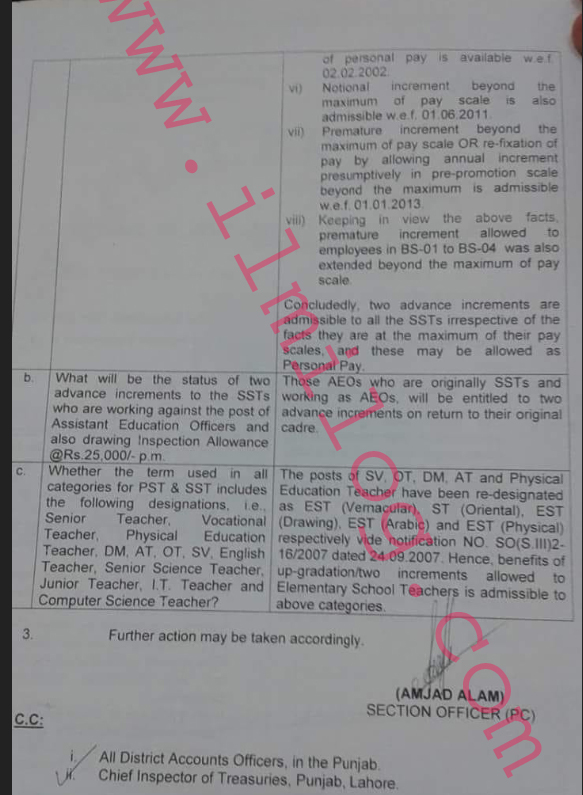 What will be the status of two advance increments to the SSTs who are working against the post of Assistant Education Officers and also drawing Inspection Allowance @Rs.25,000/- p. m.
c. Whether the term used in all categories for PST & SST includes the following designations i.e. Senior Teacher. Vocational Teacher. Physical Education Teacher. DM. AT. OT, SV, English Teacher. Senior Science Teacher. Junior Teacher. IT Teacher and Computer Science Teacher? 1. Two increments have been allowed to SSTs in their relevant pay scales The notification silent about the issue raised: but it has been mentioned that earlier in 2007 the special increment was not awarded to those employees who were on maximum of pay scale However, undersigned is of the view that two increments may be given to those who are on maximum due to following reasons-') When the announcement was made by Finance Minister, budget passed by provincial Assembly and thereafter summary approved by Chief Minister no such differentiation was made ii) FD's original notification does not point out any difference between the two categories. iii) If an employee is on penultimate stage then he will be given at least one increment while sanction was for two increments which will be against the spirit of sanction iv) Discrimination may be claimed by the deprived teachers v) Beyond maximum of the pay scale, facility of personal pay is available w.e.f 02-02-2002.vi) Notional increment beyond the maximum of the pay scale is also admissible w.e.f 01-06-2011. Vii) Premature increment beyond the maximum of pay scale OR re-fixation of pay by allowing annual increment presumptively in pre-promotion scale beyond the maximum is admissible w.e.f 01-01-2013. Viii) Keeping in view the above facts, premature increment allowed employees in BS-01 to BS-04 was also extended beyond the maximum of the pay scale. Concluded, two advance increments are admissible to all the SSTs irrespective of the facts they are at the maximum of their pay scales and these may be allowed as Personal Pay. 2. Those AEOs who are originally SSTs and working as AEOs will be entitled to two advance increments on return to their original cadre. 3. The posts of SV, OT, DM, AT and Physical Education Teacher have been re-designated as EST (Vernacular), ST (Oriental), EST (Drawing). EST (Arabic) and EST (Physical) respectively vide notification NO SO(S III) 2-16/2007 dated 24 09 2007. Hence, benefits of up-gradation/two increments allowed to Elementary School Teachers is admissible to the above categories.